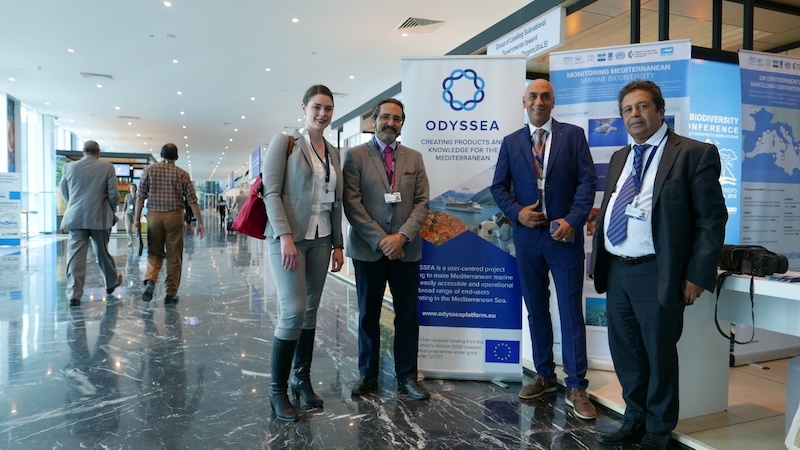 The EU-funded ODYSSEA Project was given the opportunity to run an official “side event” highlighting its partnerships and capacity-building activities in North Africa and the Eastern Mediterranean, as part of the UN Biodiversity Conference held in November 2018 in Sharm el-Sheikh, Egypt. ODYSSEA was represented at the high-profile international event by several partners involved in the project: the Association for Integrated Management (AGIR), the Arab Network for Environment and Development (RAED), together with the UNEP Specially Protected Areas Regional Activity Centre (UNEP/MAP-SPA/RAC) and World Conservations Monitoring Centre (UNEP-WCMC). ODYSSEA’s well-attended side event featured presentations by UNEP/MAP-SPA/RAC on ODYSSEA’s network of nine marine observatories currently being established across the Mediterranean, as well as detailed information provided by local partners leading the establishment of two of the observatories. 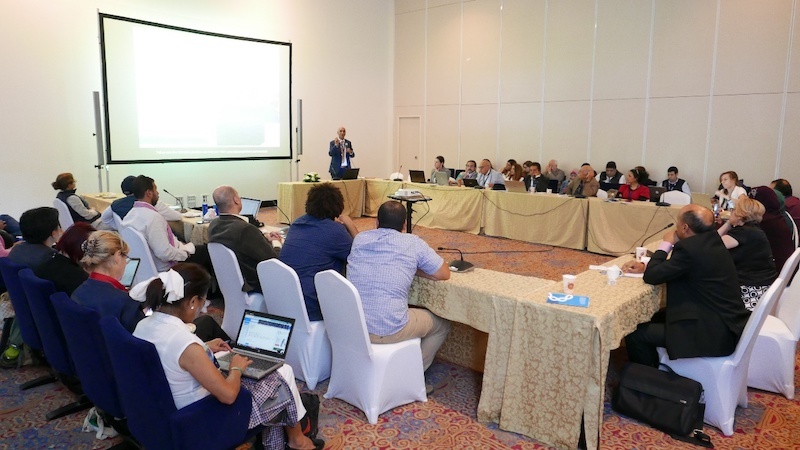 AGIR presented the progress being made on the observatory at Al Hoceima National Park in Morocco, and RAED discussed the observatory being established at Abu Qir Bay in Egypt. Both partners stressed the importance of the locations chosen in terms of habitat biodiversity and local populations that depend on healthy ecosystems and natural resources for their livelihood. The talk by UNEP/MAP-SPA/RAC noted the ODYSSEA observatories’ important contribution alongside existing marine monitoring and data collection programs in the region, such as the Mediterranean Platform on Biodiversity. Capacity-building activities touched on during the ODYSSEA side event included in-country workshops and summer schools featuring courses on operational oceanographic modelling, ecosystem modelling and operational oceanography, as well as and training sessions for observatory managers and technical staff. To date, ODYSSEA has held four such training events, with four more coming up in France, Germany, Tunisia and Morocco. Questions from the side event audience demonstrated stakeholders’ interest in having access to high-quality data to inform decision-making, as well as the challenges that potential users of the ODYSSEA platform currently face when trying to find this information quickly. The discussion thus confirmed the high relevance and importance of ODYSSEA’s mission to facilitate easy access to data and information on the Mediterranean Sea for the use of decision-makers and other stakeholders. Participating governments at the Conference from around the world agreed on a comprehensive and participatory process for developing the post-2020 global biodiversity strategy. Together with stakeholders from the non-governmental and business sectors, they emphasised the importance of investing in biodiversity for people and the planet. Capacity-building and partnership activities are recognised as being critical to this process and are actively supported by the Secretariat of the UN Convention on Biological Diversity through the Sustainable Ocean Initiative, which held a Capacity-Building Workshop for Northern Africa and the Mediterranean in Morocco in October 2018, with the participation of the ODYSSEA project. ODYSSEA is a user-driven project, and to ensure that the products and services we are developing meet actual data and information needs, we are seeking feedback from stakeholders living and working around the Mediterranean Sea. We invite you to take our ‘user needs survey’. Alternatively, if you have recommendations or would like more information about ODYSSEA, please contact us.